Existing home sales up 3.0% in February 10:11 AM ET Wed, 21 March 2018 | 01:22Home sales rebounded more strongly than expected in February, and the National Association of Realtors says they could have been even higher if there were more homes for sale. That is the range where the supply shortage is worst. Home sales did fall sharply in the Northeast, where property taxes are very high in some states, but the Realtors say that was more due to horrendous weather than anything else. Realtors polled for the monthly survey said they are hearing very few concerns from buyers about rising mortgage rates or the new tax laws, even fewer concerns than in December, when the tax laws were in final debate. That is not the case for potential sellers. "The one concerning trend is the interest rate lock effect," said Lawrence Yun, chief economist at the NAR. Sellers are telling agents increasingly that they do not want to move because they will lose the record-low mortgage rate they have locked in. The February sales figures, however, are based on contracts signed one to three months earlier, when rates hadn't moved higher yet. "That said, higher rates are actually spurring buyers to step up and lock in with a purchase and a funding rate before they head even higher," said Peter Boockvar, chief investment officer at Bleakley Advisory Group. "This was seen in the weekly mortgage application data [last week] where purchases rose 1.4 percent week to week and 6.2 percent year over year." Mortgage rates are not historically high today, but they are about half a percentage point higher since the start of this year and are clearly on an upward trajectory. "Mortgage rates are at their highest level in nearly four years, at a time when home prices are still climbing at double the pace of wage growth," added Yun. "Homes for sale are going under contract a week faster than a year ago, which is quite remarkable given weakening affordability conditions and extremely tight supply. To fully satisfy demand, most markets right now need a substantial increase in new listings." cumulative change in earnings during the same period. - Existing, single-family home sales totaled 420,360 in August on a seasonally adjusted annualized rate, up 1.1 percent from July and down 2.2 percent from August 2015. - At $526,580, August’s statewide median home price is at its highest level in nearly seven years. - Year-to-date sales are down from the previous year for the second month in a row by 0.5 percent. LOS ANGELES (Sept. 15) – California home sales downshifted in August as low housing affordability and a tight supply of homes for sale cut into demand, especially in high cost areas of the San Francisco Bay region, the CALIFORNIA ASSOCIATION OF REALTORS® (C.A.R.) said today. Closed escrow sales of existing, single-family detached homes in California totaled a seasonally adjusted annualized rate of 420,360 units in August, according to information collected by C.A.R. from more than 90 local REALTOR® associations and MLSs statewide. The statewide sales figure represents what would be the total number of homes sold during 2016 if sales maintained the August pace throughout the year. It is adjusted to account for seasonal factors that typically influence home sales. The August figure was up 1.1 percent from the revised 415,840 level in July and down 2.2 percent compared with home sales in August 2015 of a revised 429,900. Home sales remained above the 400,000 pace for the fifth straight month, but sales have declined year over year for the sixth consecutive month. The statewide median price remained above the $500,000 mark for the fifth straight month and is at its highest level in nearly seven years. There are, however, signs of an expected slowing in price growth. The median price of an existing, single-family detached California home was up 1.7 percent in August to $526,580 from $517,650 in July. August’s median price increased 5.8 percent from the revised $497,520 recorded in August 2015. The median sales price is the point at which half of homes sold for more and half sold for less; it is influenced by the types of homes selling as well as a general change in values. The continuing rising home prices despite falling sales suggests that demand continues to outstrip new supply coming online, which is pushing prices higher. · C.A.R.’s Unsold Inventory Index, which indicates the number of months needed to sell the supply of homes on the market at the current sales rate deteriorated from both last month and last year, dipping to 3.4 months in August from 3.6 months in July. The index stood at 3.6 months in August 2015. · With the exception of Ventura, all of Southern California saw its unsold inventory decline as the market got tighter in August. Inventory either was unchanged or up over the past year in all Bay Area counties except Napa and Sonoma as new listings have started to come on the market. · The median number of days it took to sell a single-family home edged up slightly in August to 28.9 days, compared with 28 days in July and 29.7 days in August 2015. · C.A.R.’s sales-to-list price ratio* dipped in August, with sales prices slightly decreasing to 98.9 percent of listing prices statewide in August from 99.2 percent in July and essentially flat from 98.8 percent in August 2015. · The average price per square foot** for an existing, single-family home statewide was $246 in August 2016, down from $247 in July but up from $235 in August 2015. · San Francisco County had the highest price per square foot in August at $818/sq. ft., followed by San Mateo ($782/sq. ft.), and Marin ($632/sq. ft.). Counties with the lowest price per square foot in August include Del Norte ($106/sq. ft.), Siskiyou ($123/sq. ft.), and Tulare ($127/sq. ft.). · Mortgage rates are expected to remain low in the foreseeable future as weak global economic growth will likely be the norm in the upcoming months. Mortgage rates declined in August, with the 30-year, fixed-mortgage interest rate averaging 3.44 percent, unchanged from July and down from 3.91 percent in August 2015, according to Freddie Mac. Adjustable-rate mortgage interest rates also were unchanged in August at an average of 2.75 percent, essentially unchanged from 2.74 percent in August 2015. CA sales to list price ratio. ● Existing, single-family home sales totaled 415,840 in July on a seasonally adjusted annualized rate, down 4.1 percent from June and 5.1 percent from July 2015. ●July’s statewide median home price was $509,830, down 1.8 percent from June and up 3.9 percent from July 2015. ●Year-to-date sales are down from the previous year for the first time in more than a year and a half by 0.3 percent. Los Angeles (August 16) – California home sales stumbled in July as low inventories and eroding affordability dragged down the housing market, the California Association of REALTORS® (C.A.R.) said today. Closed escrow sales of existing, single-family detached homes in California totaled a seasonally adjusted annualized rate of 415,840 units in July, according to information collected by C.A.R. from more than 90 local REALTOR® associations and MLSs statewide. The statewide sales figure represents what would be the total number of homes sold during 2016 if sales maintained the July pace throughout the year. It is adjusted to account for seasonal factors that typically influence home sales. The July figure was down 4.1 percent from the revised 433,600 level in June and down 5.1 percent compared with home sales in July 2015 of a revised 438,230. Home sales remained above the 400,000 pace for the fourth straight month, but sales have declined year over year for the fifth consecutive month. The statewide median price remained above the $500,000 mark for the fourth straight month, but there are signs of an expected slowing in price growth. The median price of an existing, single-family detached California home slipped 1.8 percent in July to $509,830 from $519,410 in June. July’s median price increased 3.9 percent from the revised $490,780 recorded in July 2015. The median sales price is the point at which half of homes sold for more and half sold for less; it is influenced by the types of homes selling as well as a general change in values. More homes being sold at the high end of the market (over $1 million) and slightly fewer sales at the lower end (under $300,000) contributed to the year-over-year gain in the median price. ● C.A.R.’s Unsold Inventory Index, which indicates the number of months needed to sell the supply of homes on the market at the current sales rate, inched up to 3.6 months in July from 3.2 months in June. The index stood at 3.3 months in July 2015. ● The Bay Area region continued to see an increase in inventory, with all counties except Solano and Sonoma seeing an increase from the previous year. Active listings in Los Angeles, the Inland Empire, San Diego, and the Central Valley declined compared to July 2015. ● The median number of days it took to sell a single-family home edged up slightly in July to 28 days, compared with 27.1 days in June and 29 days in July 2015. 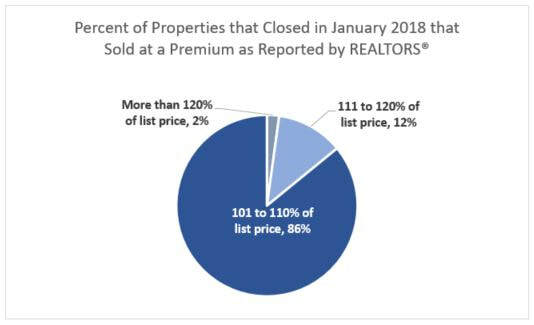 ● C.A.R.’s sales-to-list price ratio* dipped in July, with sales prices slightly decreasing to 99.2 percent of listing prices statewide in July from 99.6 percent in June and 99.1 percent in July 2015. ● The average price per square foot** for an existing, single-family home statewide was $247 in July 2016, down from $248 in June but up from $241 in July 2015. ● San Francisco County had the highest price per square foot in July at $824/sq. ft., followed by San Mateo ($788/sq. ft.), and Marin ($606/sq. ft.). Counties with the lowest price per square foot in July include Madera ($127/sq. ft.), Tulare ($128/sq. ft.), and Siskiyou ($131/sq. ft.). ● Mortgage rates are expected to remain low in the foreseeable future due to global economic uncertainty. Mortgage rates declined in July, with the 30-year, fixed-mortgage interest rate averaging 3.44 percent, compared with 3.57 percent in June and 4.05 percent in July 2015, according to Freddie Mac. Adjustable-rate mortgage interest rates slipped in July to an average of 2.75 percent, a decline from 2.78 percent in June and 2.96 percent in July 2015. ● July sales at-a-glance infographic. ● Calif. existing home sales historical. ● Share of sales by price range. ● CA price per square foot. ● CA sales to list price ratio.